This is my 2011 Double Period Project for Your Wardrobe Unlock’d. I don’t have pictures of the process, as I was generally working in a hurry and kept forgetting to take pictures along the way. I do have some notes, and will try to give as much background as I can. Menswear is still pretty unexplored territory for me. I’ve done plenty of women’s clothing, but I’ve never really been asked to do menswear. Luckily, I have a male best friend who is willing to be my guinea pig, so over the last couple years I have been working on menswear, improving my skills, and teaching him patterning and sewing in the process. It’s working out well for everyone. Nineteenth Century Fashion in Detail features a number of lovely coats from the V&A. These detail shots were my primary inspiration. In particular, I was drawn to the pleats, buttons, pockets, collars and stitching on these coats. Details like hidden buttons and flaps that hold a pocket closed, gathered sleeve heads, and M-shaped collar notches really stood out as different and unique to this time period. 1810-20 Hunting coat with gathered sleeve heads. 1815-20 coat with unusual M-shaped collar notch. 1810 greatcoat of superfine wool with hip buttons and back pleats. 1815-20 Coat. 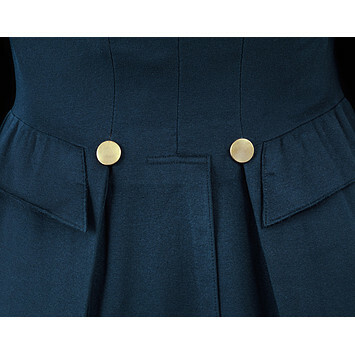 Detail of pockets and back pleats. The red and blue coats both have gathered sleeves, which the V&A says was a typical detail from 1815-20. This seemed a rather unusual detail for menswear, since styles both before and after were fairly smooth at the sleeve head. They are also both double breasted and have M-shaped collar notches, although the one on the blue coat is a rather unusual variation of that style. The line drawings on several coats also show a seam at the waist, with a very short piece of the skirt wrapping around to the front. Another detail that I was drawn to was the pattern of braiding on a pair of trousers at the V&A. Braiding and military details were common on fashionable dress, although the information for these trousers speculates that were actually intended for military wear. I liked the detail enough that I wanted to work it in to the breeches I was making, figuring it was possible in that time period, even if not common. 1810-20 trousers or pantaloons of machine-knitted cotton with silk braid. There are very few patterns for menswear from this period. The only one that came close didn’t have the right sleeves, collars, skirt, or pleats for what I had in mind. That left one option: drafting my own pattern. Feeling confident that I could tackle this, I grabbed a stack of tailoring books that had line drawings and instructions in them. I found an illustration of a coat that had similar lines to what I was working towards, grabbed some pattern paper and pencil, and set to work. Book number 1 seemed to be going well. I was drawing all the lines in the diagram, calculating measurements and angles, and connecting the dots when… it stopped. There was no more. I wasn’t missing any pages. What was wrong? Well, the book in question was an overview of tailoring systems over a long period of time, and the pattern I was studying was only being used to demonstrate a particular tailor’s work. Apparently, the author who compiled these systems into a book felt no need to print all the pages that went together; one page of directions and an illustration apparently sufficed to demonstrate his point. I crumpled up my work thus far, grabbed book number 2, and started over with a fresh sheet of paper. I didn’t like this diagram as much, and the directions seemed more complicated. I was still laying out lines and connecting dots, but then I had to start taping in extra paper and measuring strange lines that I didn’t even have a ruler long enough to draw. By the time I got to the armhole, it seemed hopelessly muddled. There was no way an armhole could even fit there, and the lines for where the collar should go also looked strange. I smoothed out my first draft and compared them, and the difference was striking. My second draft seemed all out of proportion to what I expected to see in a pattern. I figured I must have done something wrong somewhere, so I started all over again, only to come up with the same result. I finished the pattern the best I could, and mocked it up. It was horrible. It was way too big, the pleats were hanging funny, and it was wrong in so many ways. This certainly knocked the wind out of my sails and made me question my sanity in taking on this project. I called it quits, and figured the only thing to do at this point was do more research. I ended up on Amazon, ordering several more tailoring books. One of these books was Men’s Garments 1830-1900: A Guide to Pattern Cutting and Tailoring, by R. I. Davis. 1830 was a bit too late, but the coat on the cover looked enough like what I was after that I figured if it worked, I could adjust the details I needed. Chris was almost exactly the measurements of the sample used throughout the book, which meant I didn’t have to recalculate anything. It was right there in the directions, making it much simpler. The directions were easy enough to follow, and soon I had a pattern I could feel good about mocking up. The fit was really close, and only needed a few modifications, especially from the waist up. I also needed to change some design details, such as the shape of collar, cuffs, and sleeve heads. One modification I struggled with was the amount of “spring” at the hip. There seemed to be a magic measurement that would let the back pleats hang nicely without pulling the skirt out of place or looking funny in the front. This part of the process set me back quite a while. I went back through all the books and looked for directions about how to adjust this measurement. I drafted and re-drafted the skirt a number of times, and finally felt it was decent, but never did feel like I really nailed this part of the pattern. It also took quite a bit of spatial reasoning to draft out a collar with that distinctive M-shaped notch. Drafting out the collar in the book was fairly easy. Trying to figure out which pieces would sew together and how to adjust the angles on paper to get the desired result was a lot harder. I thought the pattern I finally ended up with looked pretty good in the mock up, but later realized it still needs a little tweak to lay the way I want it to. That’s something I will certainly address if I make the coat again. Overall, I found the pattern in this book to be reasonably simple to draft, and would recommend the book for anyone looking for Victorian menswear patterns. That doesn’t mean it’s anywhere near beginner level, and it might not work so well if someone doesn’t match the sample size used in the book. But the drafting itself was a matter of drawing out lines, placing points on those lines, and then drawing lines and curves to match up the points. If you feel like you have a decent grasp of patterning and have wondered what it would be like to tackle a pattern in a book like this, I’d encourage you to try it and see where you end up. The breeches and waistcoat were also drawn from books. Since they were a bit simpler in shape, they were easier to create from the scaled drawings in books rather than from the drafting instructions in a tailor’s manual. Shirts hadn’t changed much since the 18th century, and these directions for Making a Men’s Shirt were similar enough to get the basic pattern. The most significant change was to draft a much deeper collar, so it could nearly brush his cheekbones. Chris also requested a ridiculously long cravat that would wrap around his neck several times. I have a little experience with modern and traditional tailoring techniques, and had a drawerful of tailoring supplies that I’d picked up during a trip to LA. 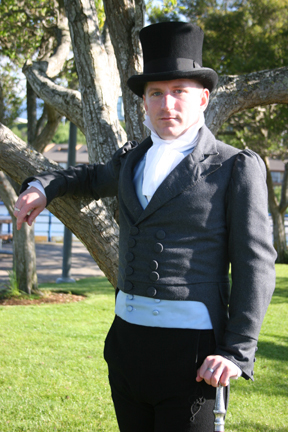 What I didn’t have was much info about period tailoring techniques and materials, or a lot of time. I knew I’d be sewing most of the coat by machine, and using as many traditional tailoring techniques as I had time for. The result was a bit of a hodgepodge, I’m afraid. I cross-referenced modern tailoring books, notes from school, and anything I could glean about period tailoring. A few books on period costume showed where interfacings, padding, and other hidden materials would traditionally be placed. The materials I used were more suited to modern tailoring, but did the job reasonably well. The wool was just a standard wool, not a superfine or broadcloth, which are slightly felted and can be handled differently. In a couple of places I had to guess about what materials to use. There might be a dotted line on the pattern, but no information about what weight of linen, canvas, or other interfacing would have been typical. Or when a description was given, I didn’t know enough to translate that into the modern materials I had on hand. Some of these guesses worked out fine, and others were too bulky or too limp, and I had to take it apart and try again. I wasn’t confident in my hand sewing ability, and so I sewed most of the coat by machine. If I had it to do over, there are some areas I wish I had taken the time to sew by hand, because I simply couldn’t achieve the same results on a machine. The M-shaped collar notch was particularly problematic. There is no way to sew those tight points and turn them right side out without blunting the tips. The period examples were so delightfully pointy, that this was a bit of a disappointment. The V&A coats were made from superfine, which is felted enough to keep the cut edges from raveling. The collars could be cut out in precise points, and the layers were stitches around the edges with topstitching or some kind of overcast stitch. Between fabric choice and hand sewing, they had no need of turning those same tight corners. I also struggled a bit with setting the collar and getting all the points to match up. Many of the problems I experienced could have been avoided with better basting and more hand sewing. All of the edges of the coat are hand finished with a running stitch, similar to the stitching on the period examples I was looking at. 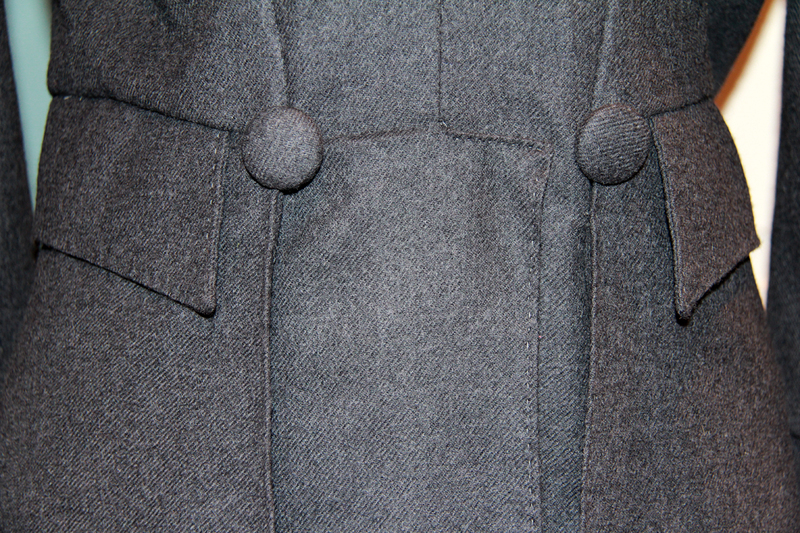 The greatcoat shows some good detail about how the back vent and pleats were stitched. I found references to swing tacks being used to hold the pleats together, which helped the back lay much nicer. My aim was to give the coat as much of a period look as possible, while saving as much time as I could by using modern techniques in places they wouldn’t show. I learned so much during this project. It had a huge learning curve, and I wish I had known more about tailoring when I started it. I can see so much room for improvement, but that really only serves to whet my appetite and get me thinking about the next coat I’ll make. 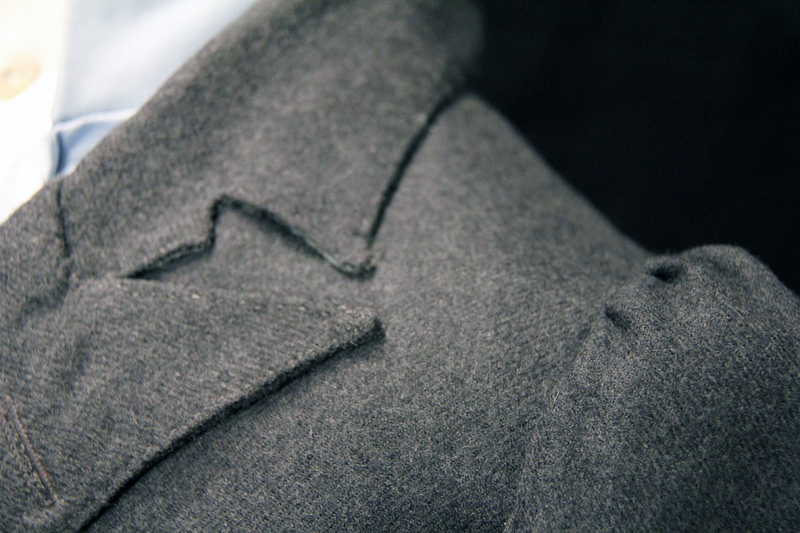 Detail of M-shaped collar notch and gathered sleeve head. Detail of back pleats and pockets. The finished outfit in all its glory.